Discover how to live out a sacred marriage. You believe your marriage has eternal purposes. you long for it to reach beyond your home and encourage others. But what does it look like to have a spiritually intentional relationship in the midst of dirty dishes, work deadlines, and car pools? In Sacred Marriage, Gary Thomas showed us that God designed marriage to make us holy more than to make us happy. Now, in A Lifelong Love, Thomas gives us the practical tools to craft our marriages into inspiring relationships that breathe spiritual life to others. Whatever season of marriage you are in, A Lifelong Love gives your the practical help you need to infuse your marriage with a spiritual passion that will not only change you but will change the world around you. 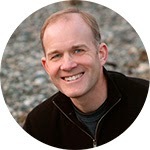 Gary Thomas is writer-in-residence at Second Baptist Church in Houston, a frequent guest on Focus on the Family and FamilyLife Today radio, and a popular speaker. His award-winning books, including The Sacred Search, have been translated into over a dozen languages and together have sold more than a million copies worldwide. Thomas and his wife have been married thirty years and have three children. Marriage is so much more than just staying together. It is about love and commitment, respect, give and take and more. I believe that marriage is made by God and is HOLY. We need to grow together in our faith and in our knowledge of God to strengthen our marriage. This book reminded me to think about the fact that my spouse is a child of God, not just my husband. Each chapter of the book has questions for you to think about. It is thought provoking. I have added this to our family library and I feel it is a good book for married couples to read. Would you like to read A Lifelong Love? 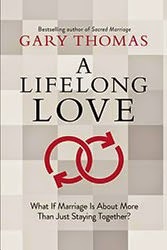 I have graciously been allowed to giveaway a copy of Gary Thomas’ A Lifelong Love. You can enter on the simple rafflecopter form below. Giveaway ends 11/13. If you have won the same prize on another blog, you are not eligible to win it again. Winner is subject to eligibility verification. Good luck! Disclosure: I received this book for free from Fly By Promotions in exchange for my honest review. I only recommend products or services I use personally and believe in. I am disclosing this in accordance with the Federal Trade Commission’s 16 CFR, Part 255: “Guides Concerning the Use of Endorsements and Testimonials in Advertising.